DETROIT – Nov. 19, 2014 – Detroit Diesel Corporation (Detroit) dedicated a new Veteran’s memorial during a special ceremony at its headquarters in Redford, Mich., on Veteran’s Day (Nov. 11, 2014). 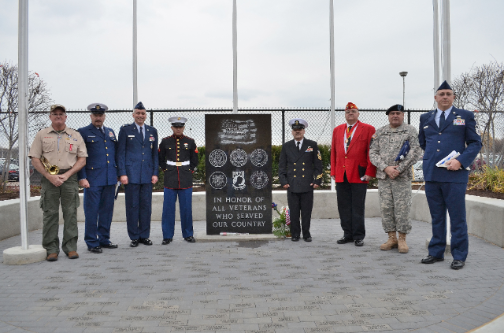 The memorial honors Detroit employees and retirees who have served in the U.S. Armed Forces. 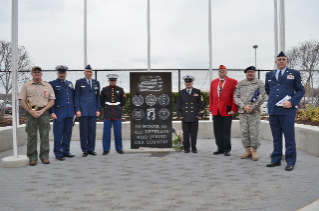 The memorial features a large black granite memorial tablet featuring an American flag, flags for each of the U.S. Armed Forces and a POW/MIA flag. Engraved pavers that surround the flags and memorial tablet are for employees to honor those that have served in the military. More than 2,200 Detroit employees work at its three-million-square-foot state-of-the-art plant in Redford. The facility manufactures the company’s heavy-duty diesel engines and axles.